The Siracusa Lemon (PGI) is rich in oil and has a high juice content – at least 34%. It’s full of vitamins, minerals and organic acids which are indispensable to the proper functioning of our body. A single lemon contains nearly all the recommended daily intake of Vitamin C for an adult, about 75mg. Vitamin C is known to strengthen the immune system, protect against infection and slow the aging of cells. 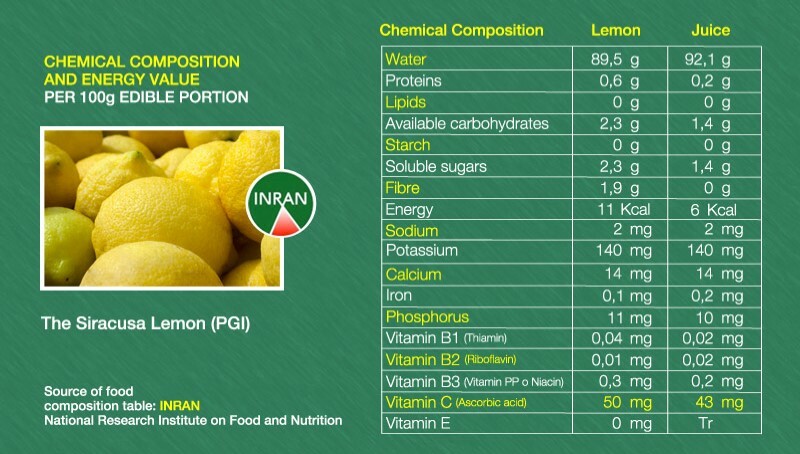 Lemons are low in saturated fat and very low in sodium and cholesterol. They are considered a good source of potassium, calcium, fiber, and vitamin B6. Lemons also contain iron, copper, magnesium, riboflavin and thiamin. So as well as being an essential ingredient in your cooking, it can play a vital role in keeping you healthy. If you want to decrease your salt intake, squeeze lemons on your food, adding flavour and acting as a salt substitute. Making lemonade can be a healthy and delicious way to get the benefits of lemons. It’s a simple drink to make. Simply squeeze the lemon into water and add the sweetener of your choice. Squeezing lemon juice into salad or fruit juice is also a good way to get lemons into the diet. Every season has its own lemon. Choose your taste!